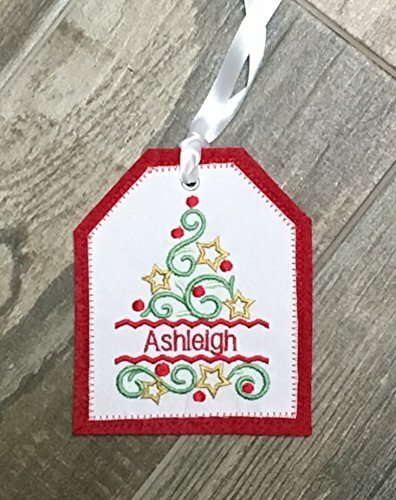 Personalized Embroidered Gift Tag, Christmas Stocking Tag, Christmas Embroidered Gift Tag, Personalized Christmas Ornament This listing is for one (1) embroidered Christmas reusable fabric gift tag/stocking tag. These tags are the perfect addition to your christmas gifts or stocking. They are embroidered to order on fabric and are stitched onto a stiff felt background to add more stability to the tag. Each tag measures approximately 4.5 x 4". Need stockings, a tree skirt or silverware pouches? Interested in customizing a different color or size? Send me a message to set up a customized listing. All of my products are lovingly made in a smoke-free and pet-free studio. If you have any questions about this product by Mountain Elegance, contact us by completing and submitting the form below. If you are looking for a specif part number, please include it with your message.